It’s inevitable that this album will be compared to 1965’s Live at the Regal, by the same blues giant and hailed as one of the greatest live albums of all time. And yet Live in Cook County Jail, recorded on 10th September 1970, is an unusual concept, as few artists had followed Johnny Cash’s pioneering example of recording in a prison. In 1968 Cash had recorded in Folsom Prison, which was followed a year later with Cash playing at San Quentin. There was no greater ambassador for the blues than B.B. King. Unashamedly anchored in the past, B.B. draws deeply upon the familiarity of his audience with classic songs. 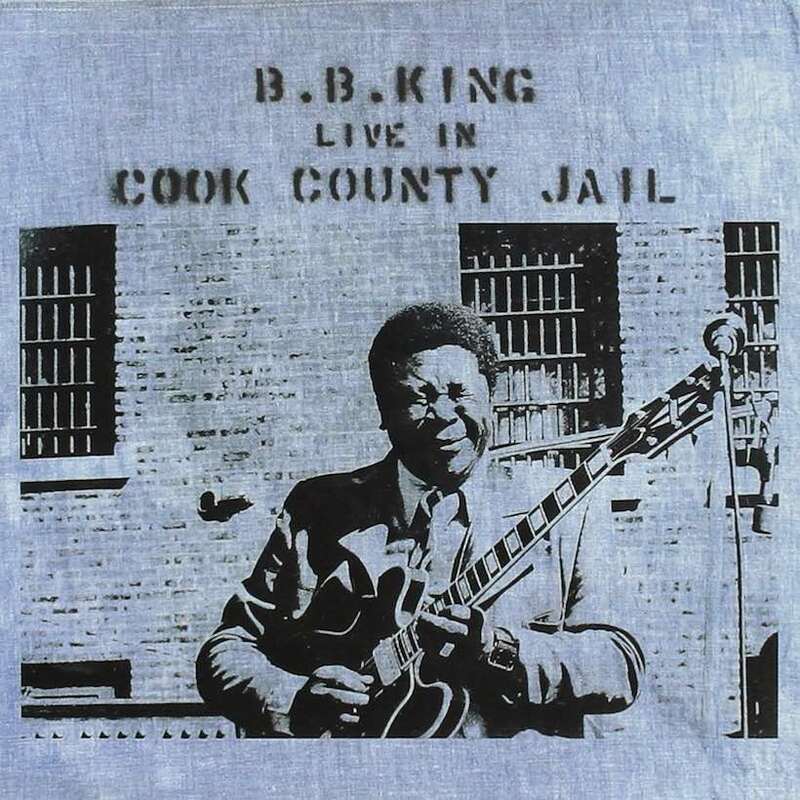 As testified by countless other live recordings, King uses his skilled banter with the crowd to steer the Cook County Jail repertoire on to timeless favourites, asking their permission to take such a liberty. As if it’s an apology, he explains that it’s a treat for him and the band to revisit old material that they rarely get to play. Well, no excuse necessary. It’s always a treat to hear him playing them, and the versions here are as great as ever. Slightly heavier, with the funkier, driving bass-line of modernity, and the fuller, maturer tone of his faithful Lucille. He first recorded the song as ‘Downhearted’ for his 1963 album Blues In My Heart, but it goes back to at least the 1950 recording by Chubby Kemp and the Ellingtonians. Although, more likely, it was the version a little later by Louis Jordan and his Orchestra that made its impact on B.B., who from very early on, was one of Jordan’s biggest fans. B.B. is in such great voice at Cook County Jail, pitching as high as he can go, and following unbelievably beautiful lyrical lines on Lucille. He sustains a soaring, hair-raising note in ‘How Blue Can You Get’ that’s so fine it likely claimed a few scalps on the night. Something else had happened in the years between Live at the Regal and this album. For the first time B.B. recorded ‘The Thrill Is Gone’ in June 1969 as a closing cut to the album Completely Well. The album version is a slow rocking 12-bar blues underpinned by lush, swelling strings. People loved it, sending it to No. 3 on the R&B chart and No.15 in the Billboard Hot 100. The concert version is a little livelier, horns taking the place of strings, and a choppy end section. It’s a fantastic change of direction in the live set towards funky soul, before B.B. does something quite audacious: he addresses his prison audience, ingratiates himself, and then ends the show with the slow ballad, ‘Please Accept My Love,’ performing some exceptional vocal acrobatics. The band then play B.B. out with an upbeat, anthemic instrumental to rapturous applause. Drummer Sonny Freeman had been with B.B. the longest, since 1960’s B.B. King Wails. So he and his boss were the only ones who had also been at the Regal. Comparative newcomers were trumpeter John Browning, saxophonists Louis Hubert and Booker Walker and pianist Ron Levy, previously with Albert King until 1968.